A dashing PIRATE CAPTAIN stands at the helm of a great ship, barking commands at his crew as they scurry across the deck and bustle in the rigging. His weatherbeaten TRICORN HAT bears a notch for every Royal Frigate he's sent to the depths of the sea. His formidable CUTLASS is all ready to go. But it's his magnificent pair of BARE FEET that earns the respect of his men and the fear of his foes. Just look at those puppies! They slap wetly against the deck as he breaks into dance, all the while spouting seafaring jargon and profanity. Wow! This guy can really cut a rug! Hey, who's writing this stuff? Don't they know that audiences won't accept a privateer wearing anything less than realistic Caribbean Brown Pirate Boots? The faux-leather cuffs make any scurvy outfit look shipshape and seaworthy. And nobody wants to get a closeup of a buccaneer's bunions! boots fits perfectly and are comfortable. Not your average Halloween style cheap stuff. Kinda pricey but cheaper than the real thing. These Pirate boots are amazing. 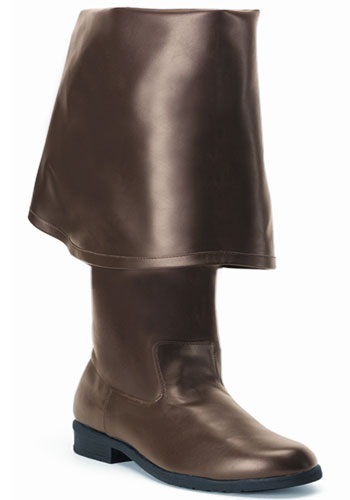 I bought these to replace a cheaper pirate boot for my Jack sparrow costume. They are well constructed and one solid piece. No zipper or ties. I went a size up on my shoe size to make sure they fit but have had no problems with them. I have had these for over six months and they have held up well. They also go well with my Zelda Link costume and king costume for the renaissance fare.